Ready for a tale of knights, death-defying escapes and dragon slaying? 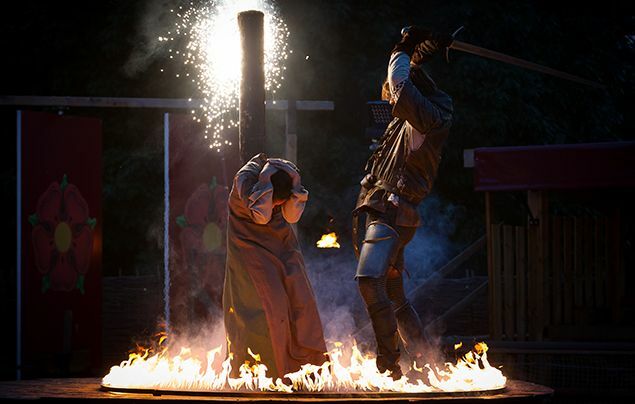 It’s all part of Warwick Castle’s explosive new evening show; Dragon Slayer! We’ve all heard of legendary figures like Robin Hood and King Arthur, but what about Guy of Warwick? Nat Geo Kids headed to Warwick Castle in the West Midlands to find out more about him! Who was Guy of Warwick? As legend has it, Guy of Warwick was a 10th-century English hero who travelled the world on a series of daring adventures in order to impress the Earl of Warwick’s daughter – Lady Felice – and win her hand in marriage. When Guy declared his love for Felice, he was rejected for being too ‘low-born‘ (not deemed important enough by society). The only way to prove his worth? To become a knight! So off brave Guy went… First, he saved an innocent woman from being put to death for a crime she didn’t commit. Next, he defeated a monster that was terrorising the Warwickshire landscape – a ginormous cow known as the ‘Dun Cow‘! But Guy’s toughest test was when he faced a terrifying fire-breathing dragon, slaying it with his sword and becoming a hero! At last, Guy had earned Lady Felice’s hand in marriage. They were married and lived happily, for a time. But during the years that followed, Guy began to feel remorse for his violent past, and decided to take a holy pilgrimage to Jerusalem. On his return to England, he heroically helped to save the country from the ferocious invading Vikings! Exhausted and ill, Guy took refuge by the banks of the river Avon in Warwick and sent word of his return to Felice in the form of a golden ring. Sadly, Guy died and the heartbroken Felice died shortly afterwards. But as legend has it, in death, the couple were finally reunited, forever. See Guy in action at Warwick Castle! 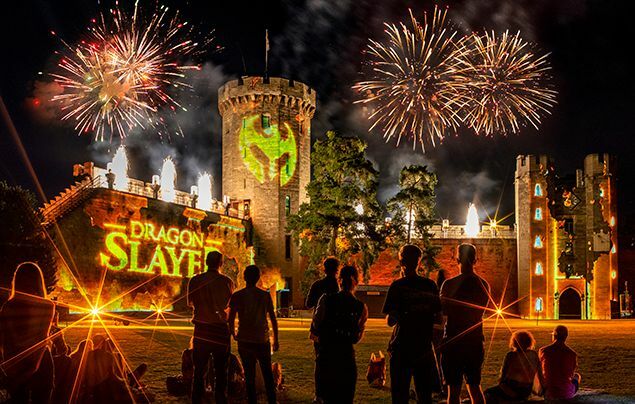 Dragon Slayer, Warwick Castle’s summer evening shows, tells the tale of the local mythical hero, Guy! 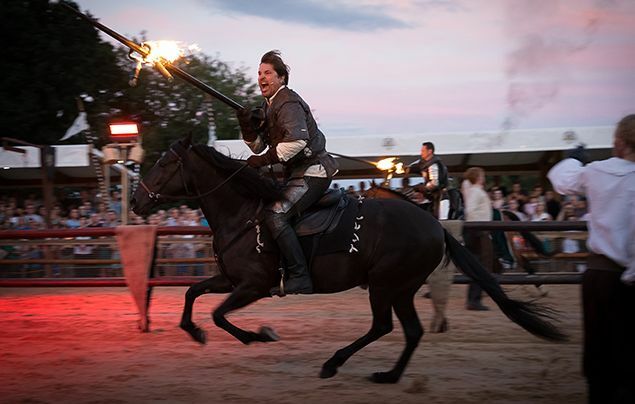 Watch as a dazzling jousting show brings the tale of Guy and Felice’s love story to life. Then follow the knights over the castle bridge into the courtyard, where a foul beast has taken over the castle – a fire-breathing dragon! 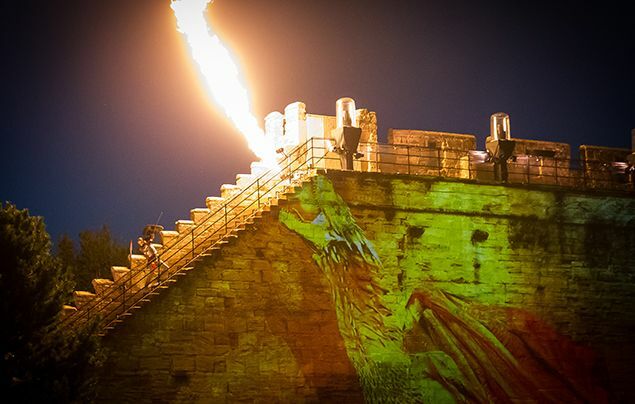 Witness a spectacular projection show as Guy battles with the beast from the castle walls and turrets, finished by a fantastic firework show from within the walls of the 950-year-old castle – roar-some! Not ready for the fun to end? Make a ‘knight’ of it in the castle’s medieval-style accommodation in the Knight’s Village. 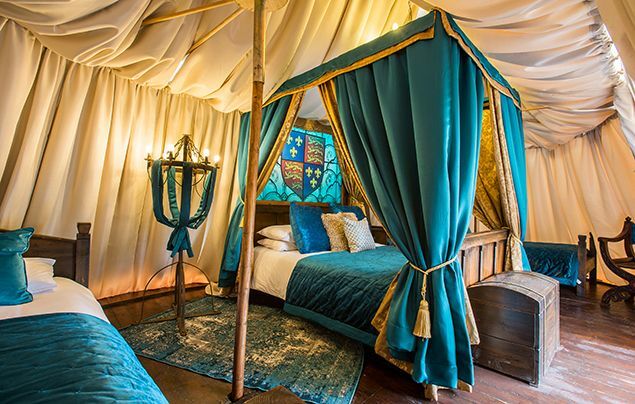 Sleep like royalty in a King’s tent, decked out with four-poster bed and sumptuous surroundings, or stay in a cosy Woodland Lodge. Your stay includes two-day entrance to the castle and a delicious breakfast in the medieval-themed dining hall. Psst! Look out for Guy of Warwick’s relics on display inside the castle, including the supposed ‘rib bone’ of the gigantic Dun Cow! Dragon Slayer is scheduled for eight performances throughout August. Charge on over to warwick-castle.com/dragon-slayer to find out more!